The company's first, heavy-lift mission to orbit satellites for the European Galileo navigation constellation has now entered the final phase of preparations for Arianespace' next Ariane 5 launch. During activity in the Spaceport’s Final Assembly Building, Arianespace “topped off” the Ariane 5 launcher with installation of the payload fairing over the four Galileo spacecraft and their payload dispenser. With Ariane 5 now complete, the launch vehicle is being readied for rollout next week to the Spaceport’s ELA-3 launch complex in advance of the scheduled November 17 flight, which should liftoff at exactly 10:06:48 a.m. local time in French Guiana. In preparations for Arianespace’s next Ariane 5 launch, the fairing is lowered over the heavy-lift vehicle and its four Galileo satellite passengers to complete launcher build-up. This mission—designated Flight VA233 in Arianespace’s numbering system—will deploy the quartet of Galileo spacecraft over the course of a nearly four hour flight. For the Galileo program, Arianespace is using the Ariane 5 ES version with an enhanced storable propellant upper stage that allows for re-ignition and long coast phases during the mission. These upgrades maximize the launcher’s performance for deploying the Galileo spacecraft, which will have a combined mass of 2,865 kg at liftoff, two at a time into a circular, Medium Earth Orbit (MEO). As a European initiative to develop a new global satellite navigation system under civilian control, Galileo will offer a guaranteed, high-precision positioning service that will end Europe’s dependence on the American GPS system. The Galileo constellation will consist of 24 operational satellites, along with spares. Arianespace already has deployed 14 Galileo on orbit validation and full operational capability spacecraft from French Guiana on seven medium-lift Soyuz missions, along with performing two other Soyuz flights from the Baikonur Cosmodrome in Russia with the GIOVE-A and GIOVE-B experimental satellites. Galileo is funded by the European Union and features innovative technologies developed in Europe. The European Commission holds overall responsibility for Galileo’s management and implementation, with the European Space Agency assigned design and development of the new generation of systems and infrastructure. 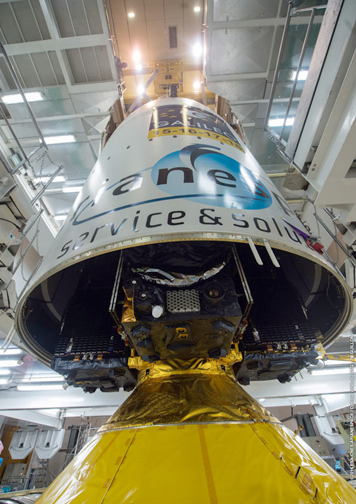 The Galileo satellites on Arianespace’s Flight VA233 are sized at 2.7x1.2x1.1 meters and were built by OHB System in Bremen, Germany, while their navigation payloads were supplied by UK-based Surrey Satellite Technology Limited (SSTL), which is 99 percent owned by Airbus Defence and Space.